16th Dail Reopens at Leinster House - Jack Lynch.20/03/1957..John Mary "Jack" Lynch (15 August 1917 - 20 October 1999) was the Taoiseach of Ireland, serving two terms in office; from 1966 to 1973 and 1977 to 1979..Lynch was first elected to Dáil Éireann as a Teachta Dála (TD) for Cork in 1948, and was re-elected at each general election until his retirement in 1981. He previously served as Minister for Finance (1965-1966), Minister for Industry and Commerce (1959-1965), Minister for Education (1957-1959), Minister for the Gaeltacht (1957) and as a Parliamentary Secretary. He was the third leader of Fianna Fáil from 1966 until 1979, succeeding the hugely influential Seán Lemass. Lynch was the last Fianna Fáil leader to secure (in 1977) an overall majority in the Dáil. 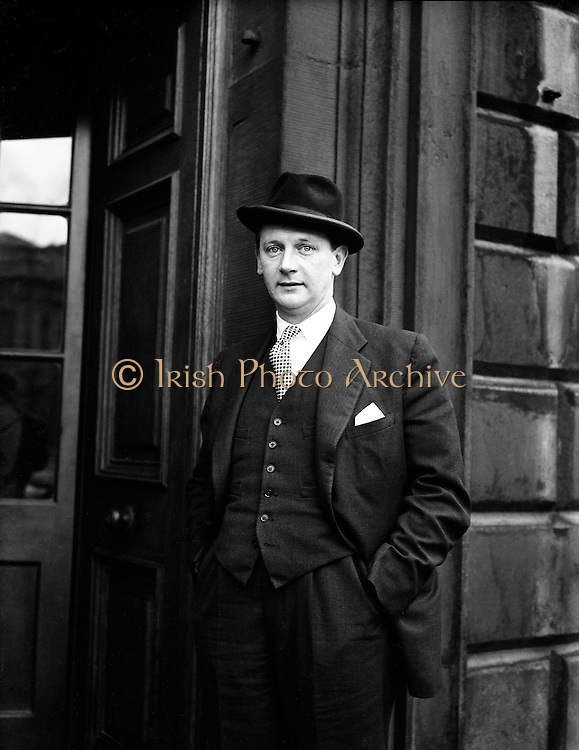 Historian and journalist T. Ryle Dwyer has called him "the most popular Irish politician since Daniel O'Connell. ".Prior to his political career Lynch had a successful sporting career as a dual player of Gaelic games. He played hurling with his local club Glen Rovers and with the Cork senior inter-county team from 1936 until 1950. Lynch also played Gaelic football with his local club St. Nicholas' and with the Cork senior inter-county team from 1936 until 1946. He is widely regarded as one of the greatest dual players of all-time..In a senior inter-county hurling career that lasted for fourteen years he won five All-Ireland titles, seven Munster titles, three National Hurling League titles and seven Railway Cup titles. In a senior inter-county football career that lasted for ten years Lynch won one All-Ireland title, two Munster titles and one Railway Cup title. Lynch was later named at midfield on the GAA Hurling Team of the Century and the GAA Hurling Team of the Millennium.